Cory Adams - the Republican chairman of Story County in Iowa – endorsed the Texas congressman's presidential bid at a campaign event in Ames, Iowa. That's significant for a few reasons. Ames is the largest city in Story County, home to over 50,000 residents. And it is in this city that a widely-watched showdown between the GOP presidential candidates will play out on August 13. The Ames Straw Poll will test the candidates' popularity and could be a sign of their electability. Having the endorsement of such an influential political figure in and around Ames will surely give Paul's campaign something to boast about as it aims for a strong showing in that contest. Adams explained to CNN the rationale behind his endorsement of Paul. "I try to go for the candidates that line up mostly with the values, the principles of the [nation's] founders," Adams said. "Out of all the candidates in this cycle, I found Ron Paul to be the one with the longest, most consistent voting record to back up those principles and concepts." How might Adams' endorsement help Paul with voters? Adams explained: "Back in 2008 there were a lot of people within the Republican Party that kind of disregarded Congressman Paul. And basically didn't just count him in and/or wouldn't even mention him. So when you can have a county chair who is part of the Republican Party, part of the establishment and support him, it gives him more credibility within the party and brings him back from the fringe." Adams explained that some voters previously labeled Paul "a whack job, fringe candidate" – and that his and other endorsements from mainstream Iowa Republicans could help change that. At the same event, Iowa State Rep. Jason Schultz also spoke about his support for Paul. Though the endorsements are positive for Paul's campaign, it's unclear just how far they'll go. Despite a passionate and loyal group of supporters – often very visible and vocal at Paul campaign stops - the candidate has trailed fellow GOP contenders Former Minnesota Governor Tim Pawlenty, Minnesota Rep. Michele Bachmann, and at times others, in some Iowa polls. In some other polls, Paul has fared better against Pawlenty. During his speech, the candidate talked about his chances in the Ames contest. Citing growing enthusiasm for his message, Paul said: "There's more enthusiasm with the people that are true believers. And like I said…Ames lends itself to that. I wish I could say that I am the frontrunner and nobody is ahead of me and it's a shoe-in. But the truth is, we can do it and will do very, very well and hopefully come in first." "But I'll tell you what – I'll challenge any other candidate for the enthusiasm of our supporters." Paul has a problem, the GOP knows that he is too old and too smart to "play ball" with them and their underlining agenda, and his stances on what he wants to make legal (prostitution, gambling, drugs) isn't feesable, his stance on dismantling the FED isn't attainable and can't get the votes to legalize and dismantle any of it. His stance on the dept. of defense will hit the pockets of his colleauges so in essence, everything he is proposing can't and won't happen. alot of people are saying that Paul has been right for the past 30 yrs and we didn't listen republican, or democrat. They are right, and because Paul was right, that makes the things that Carter said (that we didn't like to hear at the time) 30 years ago completely correct. Google the great Malaise address and you will see what I mean. Ron Paul is my President. It's sad that CNN writers have so little insight into this election that they acknowledge Ron Paul's growing power only when preceding articles by Reuters and other major outlets make it clear that CNN will expose their ignorance if they don't jump on the bandwagon. The only honest candidate. He's a doctor, delivered 4000 some babies, and has been re-elected 17 times or something like that. Plus he understands Constitutional Law like no one else. He cares more about you, than he does himself. Never took a Medicare or Medicaid patient, or hasn't in a long time, to validate his stance on governmental intrusions on health. Understands the role of charity and how the wealthy (although he is not wealthy) would give. He would abolish many governmental institutions to reduce the size of govt. He would legalize a drug that would bring BILLIONS in tax revenue, like marijuana. wake up folks. The only man on YOUR side is standing right in front of you, wouldn't you want him on your team to advance this great nation? Adams said. "Out of all the candidates in this cycle, I found Ron Paul to be the one with the longest, most consistent voting record to back up those principles and concepts." That is the thing we have to remember not to be fooled by the flattering lips and speeches but to check the voting records and Ron Paul has been consistent. He has never voted for anything that went against our Constitution and he would be the only one that would get our financial crisis in control. I am really happy to hear that big politicians are starting to listen to Dr. Paul. He has a very positive and enlightening message and has already educated tons of people as to what the proper role of government should be: to protect the liberties of its people! 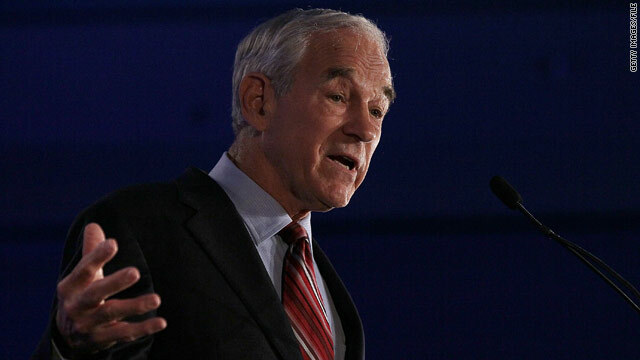 Ron Paul will win the straw poll and go on to win the presidency!